Around 171 cm (around 5'7). Had my PT today, my thighs getting already thinner, the therapist said I shouldn't worry about it (I mentioned him I'll have Stryde after this). I'm walking more with every day. Sleep was not perfect, as I already didn't get IV medication, only tablets, plus sc LMWH. The pin sites are all clean, but Dimitrios said it is quite possible, that I will experience some inflammation/infection, in this case oral antibiotics will help. Pain level is ok (I don't know how to rate, as it is quite subjective), but as i wrote before, I think no-one should expect the complete absence of pain, and tbh I welcome pain, as it is usually a good sign (if not crucial, or too lengthy), but in other hand it exhaust you mentally as well. Thanks Notatroll. Another thing to add, that however pain is present, it is continuously diminishing (first 3 days were the worst, than 4-6 days moderate, and now more than bearable, of course still there), and I have to add, that I didn't have any epidural canule after 1-3 days post op as many others, and the IV opiate-class was also given in a continuously lowering manner. I'm just being realistic by saying don't expect to not feeling pain at all. Hey man, could you show some pics of the hospital and your hotel environment? Sorry guys, now I tried to attach photos from chrome (I thought safari is the problem, I use mac), it didnt allow, than tried to insert photo, same result. 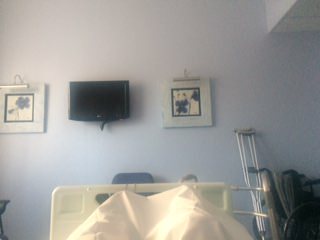 Tbh I don't care if I can attach photo of the room, or the food (I've already described what is my opinion, it is a Greek private hospital, use your imagination, and google , but I would like to show a photo of the frame, which is definitely more important. I was looking in the description of the forum motor, they don't tell anything specific, if someone knows a real solution don't hesitate pls. Yea I would defintely like to see some pics of the frame. It's good to hear that the pains diminishing day by day. Just use imgur for the pics, click the browse button and upload a picture. Then just post the link it gives you. lol no problem its much easier then some of the sites people use here to post pictures. The frames look so nice and modern, how many pins do you have? I didn't count it, but around 25 small pins (if you see a TSF, you can see thicker pins (half-pins), and these, you can read on the net about them), they cause less scarring , and Giotikas believes they give more stability. Did you doctor tell you anything about stryde pricing or availability ? Pricing is 6-7000 EUR+ compared to PreciceII, availability: end of this year (maybe earlier). Nothing exceptional happened, I will reach 1 cm tomorrow, I moved out of the hospital last Sunday. As many other wrote, it is really important to have someone with you - in my case - in the first week after moving in the flat (I didn't prepare for this, but had a nurse coming every second day to check, cook, shop etc..). With every day i feel more confident living alone, and moving around the flat. As phoenix and others wrote, it is hard even to walk because of the discomfort, and pain, but I'm pushing myself to walk at least 3 times a day (thank to my high metabolism I can't avoid it ). I just try not to overdo the activity. Congrats on the 1cm!! Can you tell us more about the day to day activities regarding living alone during LL? Are you to go to the bathroom and warm your meals by yourself? How independent can you be? What ammount of money do you recommend to save for tsf method with Giotikas? PT and walking min. 2x/day: in the morning I - logically - go to the bathroom with walker, after coming back try to do some rounds more (if the pain is not too high, but with a tramadol-lyrica preliminary combo it is easier to overcome soreness). In the afternoon/ evening second round of walking, and before going to bed the last round. Dr Giotikas insists on walking, he calls me regularly, and checks every crucial steps. Eating - as much as you can, low sodium, sugar meal 3x/day, I'm using a specific unflavoured protein shake brand (that I'm flavouring for myself with organic cocoa, eritrit combo) as well (for dessert it is perfect). I brought with me a huge amount of vitamins, supplements which I'm not taking currently, I will use them for the consolidation phase. Btw all the meds are included in the price (like xarelto, painkillers, chlorhexidin, even vitamin d in small liquid bottles - which i was surprised about). Sleeping is crucial. I agree with many, that discipline is essential for us during this journey. By that I mean, if you don't have a proper schedule, don't occupy yourself, or loose focus because of pain, the level of discomfort, and pain get get substantially higher. I'm not saying if your mindset is optimal you don't feel it, just the whole experience can be better or worse, and pain is the primary burden of getting a good quality sleep. Independence is getting better with every day, but have to be patient. I don't personally cook, as standing for longer makes my legs sore, but I let the house aid cook, clean, shop everything. It depends on the amount of lengthening, and duration of staying there (I guess 5-6 cm), see my post before with the approximated costs in staying in Greece and add the price of Giotikas (there are many things included in his price:meds, physio etc..). Try to cook seriously. I could so can you. The only problem with cooking , using walker and wheelchair is that after a while my feet would swell and i had massive discomfort. It actually might not happen to you since you dont have foot holders. Walk , stand as much as possible and I know its but you legs need to work. I was learning walking with crutches by putting a wheelchair in front of me in case of falling and then making small steps. It worked but was difficult. Thanks dooms, I think I'll try to push myself more, just I'm maybe to cautious to avoid all failure points. I'm doing 1mm/day (4 clicks) and reached 1 cm. Try to walk as much as possible, yesterday walked 6 times (smaller distances, more frequently). 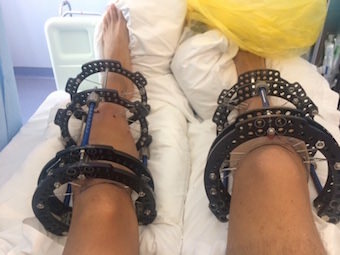 When I start to walk, at the beginning it is quite painful, but after 1-2 min it becomes a lot better, I guess because of the enhanced circulation, and the diminishment of piled up blood in the lower extremities (these are just guesses). Sleeping was surprisingly good, I slept around 8 hours (usually I sleep during the distraction between 5-8 hours, but with some breaks in between), but because of the dull, gnawing pain I can only fall asleep after a tramal (50)/lyrica (75) combo. I'm thinking to do 0,75/day, maybe I wouldn't need the painkillers, or stay at this rate, but in this case I'll have to take 2xtramal+lyrica/day (before physio, and before sleep). Guys, if you have experience with painkillers, and how to take, or not, could you write how you decided? is difficult to do the clicks o turns ? is accurate ? also imo 1 mm per day on tibias is to much, You have talked about this rate with Dr. Giotikas? No, the clicks are easy, no substantial sense during that. He just told me to do 1mm/day until I think 5 cm, over that 0.75 until 6.5, and maybe over it one should do 0.5 or so. I'm however thinking to make the whole process with 0.75, I'll mention it him next time, until than 1mm (or by feeling, if would make my sleep too hard). hi boss i am also doing limb lengthening myn is 20th day of lengthening and 28th day post surgery.I stopped taking pain killers from almost a week. Cool, I also will diminish the dose to 0 with time, and take only after a lot of work, or if falling asleep is hard. Happy to hear from you Zakika. Get well soon! Good to hear that you are able to walk more and that the sleep isn't too bad. Are you still at 1mm/day? You should see if it's ok with Dr. Giotikas to reduce the rate hopefully that will lessen the pain. Hey Great321 I remember you saying that you were also going to have surgery with Giotikas in a few months. Is this still the case? yes, I'm doing 1 mm/day, still doable, but recently was too eager, and I was walking the last 3 days like 7-8 times a day (almost every hour), and one of the pinsites get irritated, inflamed, and finally ulcerated, so after discussing with Dr Giotikas, he suggested to walk only 2-3 times/day, until the wound heals. I'm taking the painkillers, however pain is getting slightly better every day (now the inflamed pinsite is tender, when bending knee), but sleep would be hard without them. Thanks for your sharing and you are so kind responding every questions detailedly. I also consider having surgery October this year in Greece and could I ask you a question that how you rent a apartment and monthly price? Thanks you! Do you hire a caretaker? If you have, could I ask how did you find? The last days were quite uneventful. After pushing too hard diminished walking to 3-5/day, which was a good decision, my inflamed pinsite started to heal. Walking is less painful with every day, I'm taking the painkillers (tramal, no NSAID of course), and won't stop them abruptly, will adjust to the level of discomfort. By next Wed-Thu I will reach 2cm. Now I'm already increasing my protein intake, and started to increase gradually the bone generating supplements (VitC, D, K2, silica, NAC, selenium, Mg, B-complex, Flavonoids, quercetin so far). I'm preparing to a slower callus formation from previous experiences, I hope I won't "overshoot" with supplements too. And another thing: Dr Giotikas told me to slow the distraction rate to 0.75 from 2 cm for couple of days, as changing the rate of distraction from time to time induces callus formation more effectively (that I will definitely need).